To honor and appreciate coaches and co-curricular staff who enrich the lives of EGR students and support the Jimmy Gerken Fund. 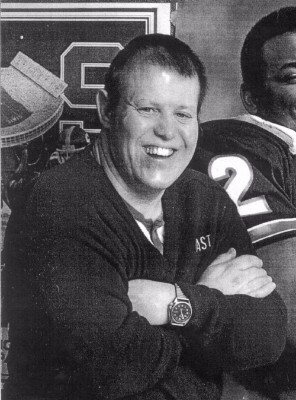 The Jimmy Gerken Fund was established within the East Grand Rapids Schools Foundation to support athletics and co-curricular activities within the EGR Public Schools while remembering Jimmy and the many life lessons he taught our students and community. Donations to the Jimmy Gerken Fund will be placed in an endowment to support these activities for years to come. Join us in supporting the activities that were important in Jimmy's life as well as many of our students' lives. Thank and recognize a coach that has made an impact in your child's life by making a tax-deductible donation of $20 or more to The Jimmy Gerken Fund. We will recognize your honorary gift in the next Foundations newsletter as well as provide you with a certificate to present your honoree. Questions: please call the EGRSF Executive Director, Amy Stuursma, at 616-235-3535. Gerken Appreciation Award: $20.00 each - multiple awards can be purchased in one transaction. Please be sure to enter information on award recipients below. Name(s) of Gerken Appreciation Award recipient(s) as you would like them to appear on the certificate. Certificates for multiple coaches can be included on this one form. I would like to pick up the certificate so that I may present it personally. I would like the EGR Schools Foundation to send the certificate to the recipient.